New England Journal of Medicine on October 8, 2009, reports CDC research that indicates 7% mortality in U. S. H1N1 cases - above normal seasonal flu. H1N1 cases doubling each week and virulent strain of H3N2 coming north from Southern Hemisphere. 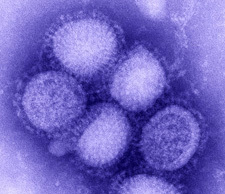 Novel 2009 H1N1 photomicrograph by CDC. See: October 8, 2009 Online Issue. Influenza in Australia and New Zealand. October 9, 2009 Houston, Texas - The October 8, 2009, New England Journal of Medicine featured two recent studies about the intensity of the new 2009 H1N1 flu virus, both in the United States and the Southern Hemisphere’s Australia and New Zealand. Perhaps the most surprising news in the research by the American Centers for Disease Control is that this past spring, 7% of Americans sick enough to be hospitalized with the H1N1 flu, have died. That 7% is a higher mortality rate than ordinary seasonal flu.